I’m not a big believer in Valentine’s Day, but I do believe that love heals many things. Since February is the Month of Love, I decided to Share the Love with a worthy cause that is near and dear to my heart. As many of you know, my husband and I are rabid Boxer Dog fans (pun intended! ), and avid animal rescue supporters. We’ve been rescued by 3 Boxers (And 2 cat, but that’s another story!). As a result, we have gotten to know Middle Tennessee Boxer Rescue. 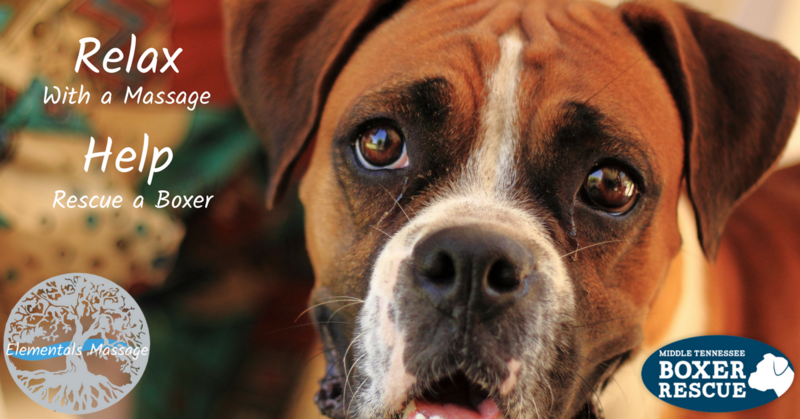 MTBR is a wonderful organization committed to rescuing and rehoming Boxer dogs in the Mid-state area. You can get more information about what they do and fabulous Boxer pics here. To support this great organization EM will donate $5 for every table massage provided in the month of February. Call or go online to show yourself some love and in the process, Share the Love with some incredible dogs!